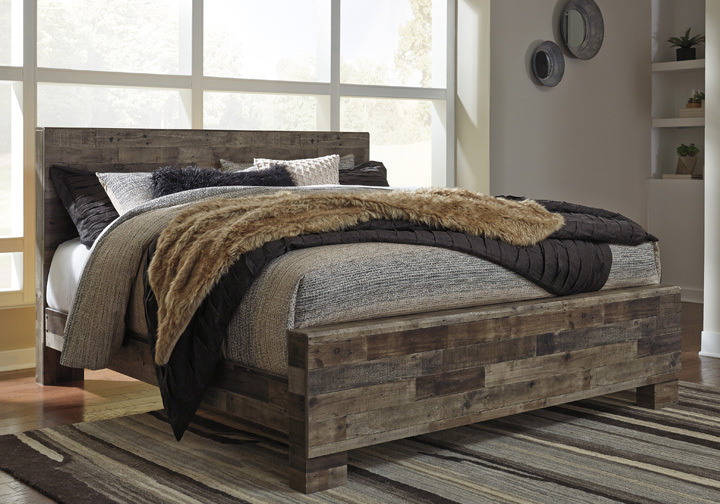 When you want a bedroom that makes a bold statement, this bed is for you. Rustic butcher block finish is tastefully roughhewn, with appealing color variations and imperfections. The substantial design is hearty and robust, perfect if you love the feel of modern farmhouse living. Rustic butcher block finish over replicated pine grain with authentic touch. Cases feature a framed front and pilasters. 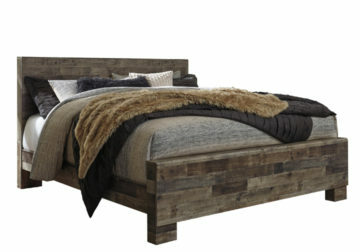 Bed features a thick and heavy design. Contemporary handles in an antiqued gunmetal finish. Side roller glides for smooth operating drawers. Drawer interiors finished with a replicated linen design. Slim USB charger located on the back of the night stand tops. Queen (57) and king (58) headboards can attach to a bolt-on metal bed frame B100-31 or B100-66 respectively. Twin (53) and full (87) headboards can attach to a bolt-on metal bed frame B100-21. All storage footboards (52S,54S,56S,84S) require the B100-11, B100-12, B100-13 or B100-14 roll slats.